Architectural programming – the analysis of any given environment to satisfy users’ needs – has become a given prerequisite to the design process. The programming process is often a complicated one: users’ present and future needs must be identified; space allowances, often predetermined, must be considered; equipment must be accommodated; all in the most cost-effective way possible. The variety of user groups is as wide as the variety of functions architecture can shelter; moreover, the different structures and needs of clients that fall within the same use classification differs so greatly that every program presents a new challenge. You cannot, for example, use the same program for every hospital you design. 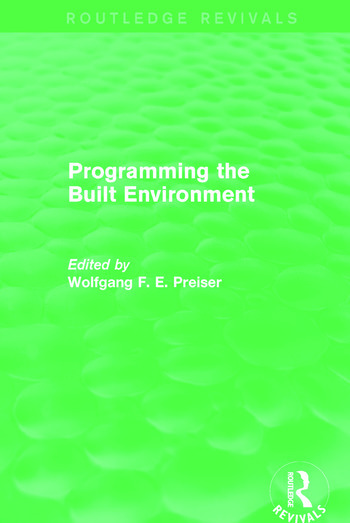 In Programming the Built Environment, first published in 1985, noted architect Wolfgang F. E. Preiser has compiled a wide range of architectural programs demonstrating applications of basic principles for different client groups. This book will be of interest to students of architecture and planning.